Jesper Pettersson is a diminutive defenseman from Stockholm, Sweden. Nicknamed the “Pitbull”, Petterson plays his game tough and ferocious whilst standing a mere 5’9” and at 190 pounds he throws his body around like a freight train. Small defenders are a rarity in today’s NHL and get the short end of the stick in most cases, but Pettersson has dealt with that his whole life and is now an NHL draft pick of the Philadelphia Flyers. Pettersson was suspended for the gold medal match and many hockey pundits believe that if he’d have been in the lineup, Sweden would’ve ended up victorious. His play in Sweden and the World Juniors had scouts talking, but it was the Flyers who would take him in the 7th round of the 2014 NHL Draft with the 198th overall selection. As it turns out, while teams may have been watching Pettersson closely, only Philadelphia came to him with an offer prior to the draft. The jump across the pond isn’t easy for European players. With Sweden having a larger ice surface, the pace is slowed down and there is more room to maneuver. 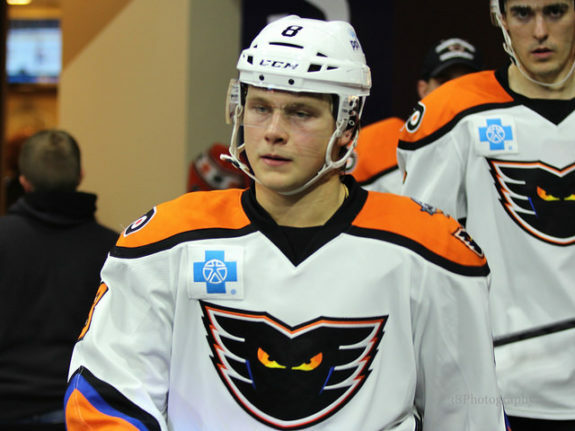 Pettersson has adjusted well to the physical style of play in the AHL with the Lehigh Valley Phantoms. Aggressive is the style of play that Pettersson thrives on. In his first 25 games with the Phantoms he has two points and 17 penalty minutes. What’s better yet is he’s being coached from a former defenseman in Terry Murray. The chances of making the NHL as a 7th round pick are slim to begin with – much less a 7th round pick under 6-feet tall. Jesper Petterson has shown a willingness to listen, learn, and perform on the ice. During development camp he was one of the most solid all-around defensemen that excelled in skating, reading plays, and winning puck battles in the corners. The NHL is still the ultimate goal, however it still might be a year or two away. Rest assured when Ron Hextall comes calling, Pettersson will be there to answer. A big thank you to Josefine Pettersson, Jesper's aunt, who translated the interview questions and answers for this article.